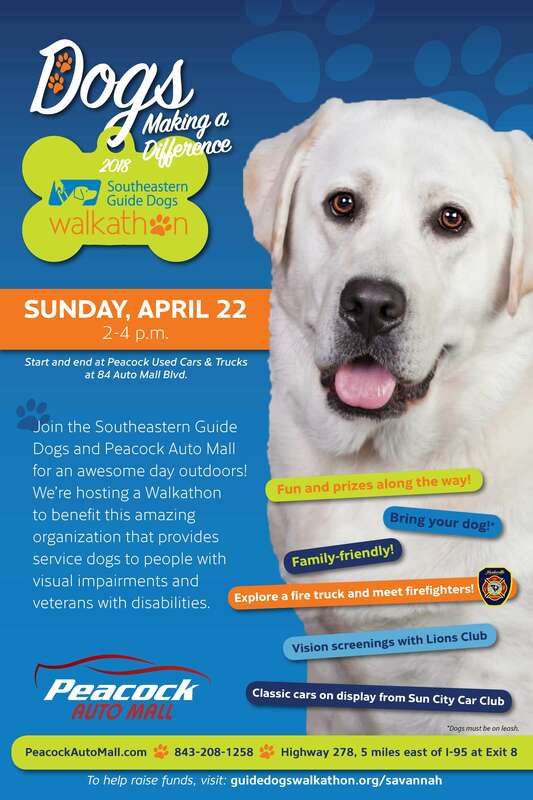 (JASPER COUNTY, S.C.) Peacock Automotiveannounces they will partner with Southeastern Guide Dogs to host a walkathon from 2 p.m. to 4 p.m. on Sunday, April 22, at Peacock Auto Mall.The event will start and end at the new dealership Peacock Used Cars & Trucks, 84 Auto Mall Blvd. The event will be kid friendly and will have local firefighters and a fire truck for children’s interaction throughout the day. People are encouraged to bring their dogs. Southeastern Guide Dogsbelieves people with visual impairments and veterans with disabilities deserve hope, confidence and independence. Their mission is to transform lives by creating and nurturing extraordinary partnerships between people and dogs. Southeastern Guide Dogs’ services include breeding and training dogs, on-campus instruction and lifetime follow-up for graduates. They’re provided at no cost to students and veterans. In line with the mission of Southeastern Guide Dogs, the Lions Club will be on site with free vision testing for anyone who is participating in the walkathon. Peacock Used Cars & Trucksoffers an inventory of more than 400 vehicles of all makes and models from the 15 brands featured at the Peacock Auto Mall, which covers 45 acres. The company established the dealership as a convenience to those looking for a previously owned car or truck so they can shop in one location. The dealership also features selections of more affordable used cars starting at $3,750. Peacock Used Cars & Trucksis expected to add several jobs to the group, which now employs about 600 people at its franchises in Georgia, South Carolina and Florida. The dealership is located in the space formerly occupied by the Nissan dealership and is managed by Daryl Booth. For more information about the walkathon, visit https://guidedogswalkathon.org/savannah. Visit the dealership online at www.peacockusedcars.comor call 843-208-1400.